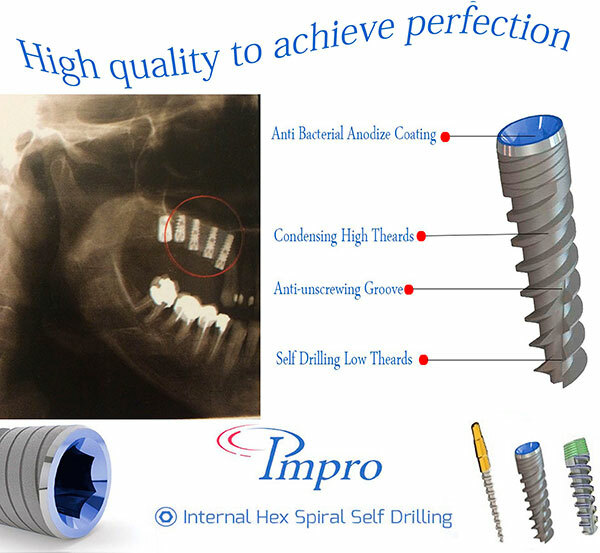 The Complete and Comprehensive solution for implants! The Impro implant is produced according to high technological standarts of the second generation implants with surfaces which can accelerate and improve implant osseointegration. This implant was sandblasted with large grits and acid eched (SLA) and passed anodization (SLA) active implant. A higher clinical success rate was observed for the anodized Titanium implants in comparison with turned titanuim surfaces of similar shapes. Two mechanisms have been proposed to explain this osseointegration: mechanical interlocking through bone growth in pores, and biochemical bonding. In order to provide the operator with profound medical knowledge sufficient practice and skills requierd to surgical implantation and prosthetic rehabilitation we run a training program tailored to the needs of specific implantologists technicians, we offer courses in Germany, Europe and worldwide.